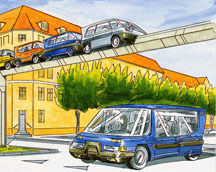 This overview is intended to provide a quick and illustrated description of a personal rapid transit technology now being developed in Denmark. More details , including a substantial set of frequently asked questions ( FAQ ) are available at other linked websites. 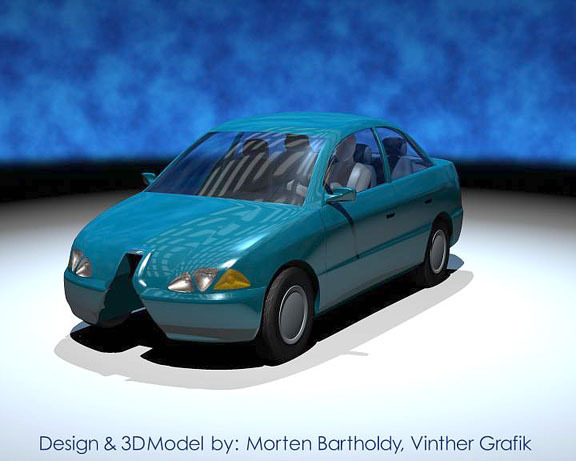 See a recent illustration (2/98) of what a RUF vehicle might look like. 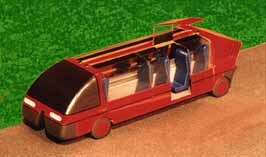 A picture of the first prototype vehicle (1/2000) is available as is an excellent article about RUF that appeared (8/2000) in EV World. A gallery of seven illustrations from a recent RUF system brochure is also available. An overall summary of RUF system concepts (as of June, 2004) is also available (600 k, pdf file). RUF (Rapid, Urban, Flexible) consists of electric vehicles that can be operated both on the conventional street system and on a rail facility. 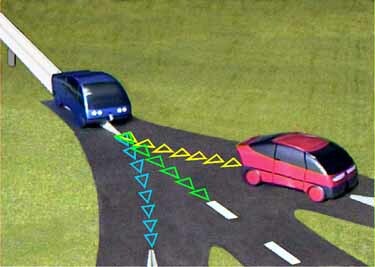 The vehicles are called "dual-mode" vehicles because of this dual capability. They can be privately owned or owned and operated by the public for use by the general public. For example, an electric, privately-owned RUF vehicle could be parked at a residence , ready for use in making the short trips that are part of our daily routines, using battery power. 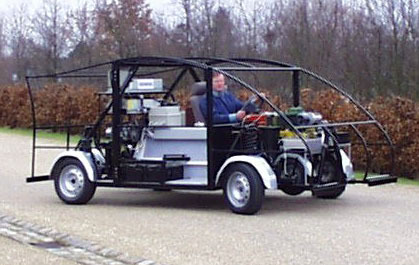 And, it can be driven to a nearby RUF station where it can enter the RUF-rail facility . The driver positions the vehicle at the entrance to the RUF-rail and then turns control over to the RUF control system. The driver is now in a "hands-off" mode and can enjoy a stress-free trip. 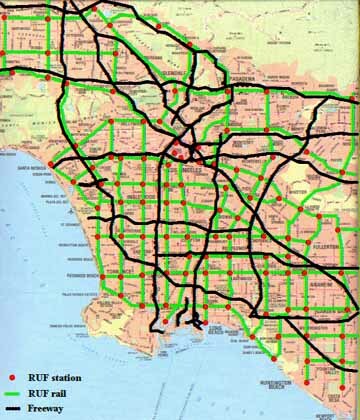 The RUF-rail facility can be placed down the median of an arterial street or in the median of a freeway . 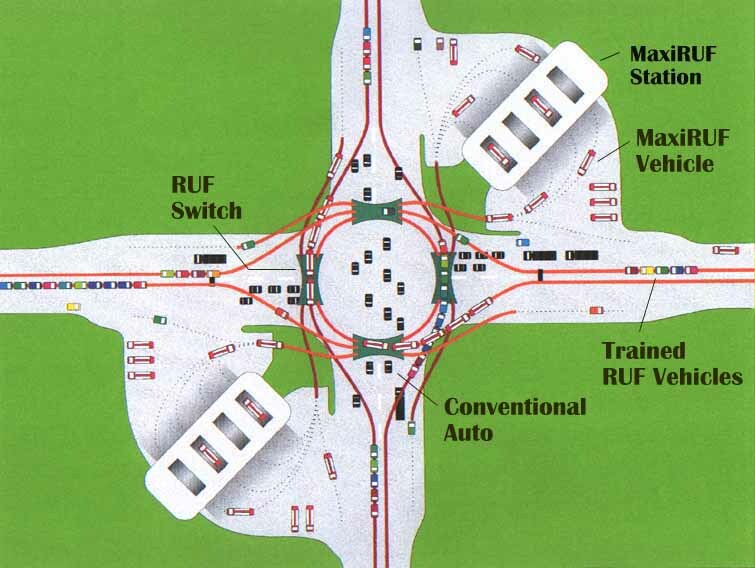 A concept for an integrated highway /RUF interchange has also been devised by the people at RUF International in Denmark. After travelling some distance on the RUF-rail, the vehicle can exit the rail facility and return to the conventional street system or switch to another rail line to continue the trip to a more distant station. 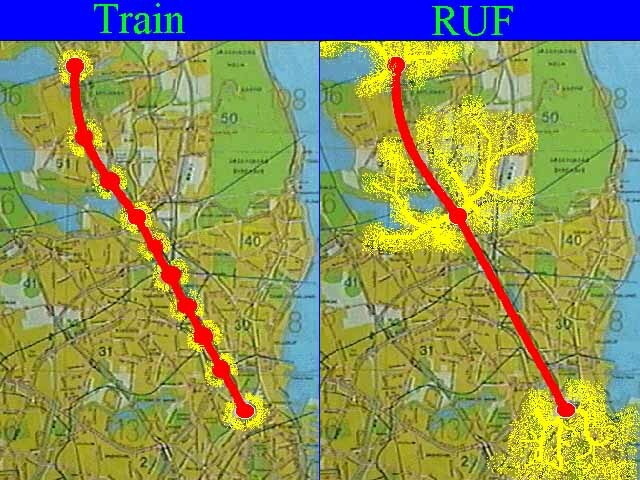 When comparing a RUF rail line with a conventional rail line, one can easily see that the service area that is provided by a RUF-rail line is much greater than that provided by conventional rail. It also needs many fewer stations making it less costly and easier to construct in already developed urban areas. An areawide RUF network (e.g. 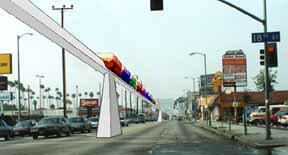 Los Angeles ) can provide areawide coverage, something that conventional rail cannot match. The RUF concept can also accommodate larger vehicles, called MaxiRUFs . These vehicles can also be operated on conventional streets, in either a demand-responsive or scheduled mode, as well as the RUF-rail facility in an automated mode. 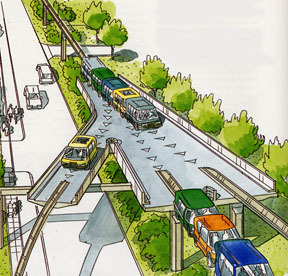 The RUF concept has been invented and developed by Palle Jensen (who provided the illustrations on this page) and others. 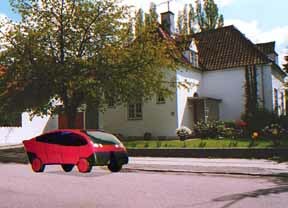 Considerable work has been done in Denmark on the RUF concept during the past several years and an initial test track was made operational in June 2000. 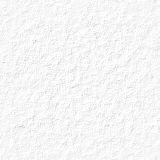 Much more detail is available at the official RUF website. 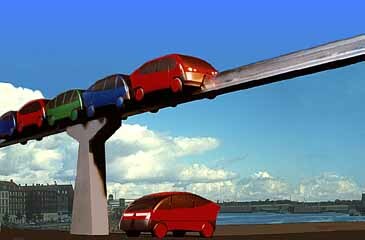 Please visit it to obtain the latest features of this emerging technology.